Eric Bittle may be a former junior figure skating champion, vlogger extraordinaire, and very talented amateur pâtissier, but being a freshman on the Samwell University hockey team is a whole new challenge. It is nothing like co-ed club hockey back in Georgia! First of all? There’s checking (anything that hinders the player with possession of the puck, ranging from a stick check all the way to a physical sweep). And then, there is Jack—his very attractive but moody captain. A collection of the first half, freshmen and sophomore year, of the megapopular webcomic series of the same name, Check, Please! 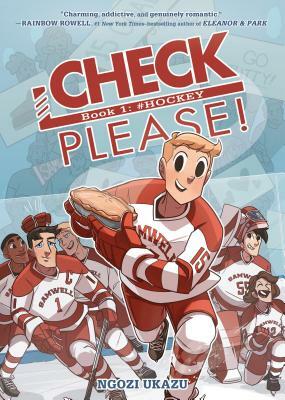 : #Hockey is the first book of a hilarious and stirring two-volume coming-of-age story about hockey, bros, and trying to find yourself during the best four years of your life. This book includes updated art and a hilarious, curated selection of Bitty's beloved tweets. Ngozi Ukazu is the creator of Check, Please, an online graphic novel whose printing campaign remains the most funded webcomics Kickstarter ever. She graduated from Yale University in 2013 with a degree in Computing and The Arts, and received a masters in Sequential Art in 2015 from the Savannah College of Art and Design. She first became interested in hockey while writing a screenplay about the sport during her senior year at Yale. But after Yale hockey won the Division I Men's Ice Hockey national championship, she became obsessed. While she used her new-found knowledge of ice hockey to launch Check, Please in 2013, Ngozi has a deep interest in sports that ranges from half-marathon training to basketball documentaries. Ngozi also cites 90's sitcoms as a major influence in the quirky, found-family feel of Check, Please.